What if you went to a birthday party and the birthday boy’s request for gifts was for each guest to give a 10 to 15 minute presentation on an idea they were taken with? That is the gist of what I wanted to convey with this sketch. There was a lot of vigorous give and take, welcomed interruptions from audience members, and a lively exchange of ideas. I showed this by catching several people speaking, the direction of gazes and the exaggeration of the speaker’s mouth and hand. I used bits of line because it expresses exuberance so well. This entry was posted in Body Language, Uncategorized and tagged Exaggeration, Line. Bookmark the permalink. Love this one! The expressions and colors are great. Many brows furrowed with interest and passion. Sounds like a great birthday party! What a cool sketch! I like the colors a lot. I am glad you like it Tamara! I also think this one is fantastic. 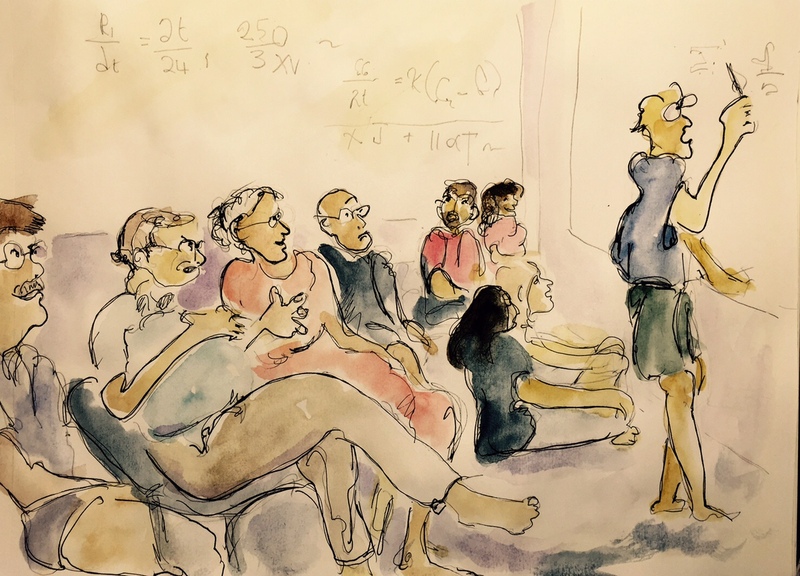 The barefoot science, angered and perplexed onlookers, and the person at the whiteboard forgetting where they were headed are all a nice touches. Awesome painting! Thank you David, I had fun with this one.